In Death Note, Near is the younger of L's two successors raised in Wammy's House, Watari's orphanage for gifted children, in Winchester, England, United Kingdom. Of the successors, Near is the more level-headed, calmly assessing the situation, while the other, Mello, is more emotional and quick to act. Much like L, Near shows various odd behaviors during his normal life. He is usually seen hunched over rather than sitting. He also constantly plays with various toys, which he uses in his theories, as well as idly twiddling strands of his hair. He shows a great respect for L, basing much of how he solves crime on L's methods, even to the point where he only takes cases that he is interested with rather than trying to pursue justice. Near uses the Wedding Text font "N" and "L" to represent himself and the fake L, respectively. But later in the aftermath, he used Old English font "L" like the original L did. He is voiced by Noriko Hidaka in the Japanese anime, Cathy Weseluck in the English dub, and Bruno Coronel in the Latin Spanish version. Sometime after L's death, he works for the United States under the SPK (Special Provision for Kira) team that is established to investigate Kira without the help of "L". He soon manages to deduce that Light Yagami, posing as L, is actually Kira. After he finds that Teru Mikami is Light's proxy and Mello kidnaps Kiyomi Takada, Near is able to switch Mikami's Death Note with a forged one, allowing him to set up a final confrontation that leaves Light exposed. Ryuk kills Light soon after. 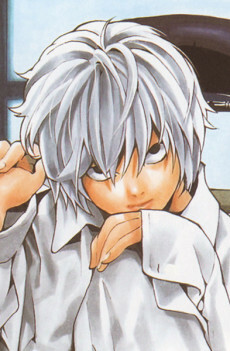 Near says that neither he nor Mello could surpass L alone, but have managed to do so by inadvertently working together. Near soon takes L's alias, and keeps on the surviving members of the SPK as his subordinates. It is speculated by Matsuda in Death Note: Oneshot that Near uses the Death Note to manipulate Mikami into failing Light in the final battle, which would shed light on some major plotholes. It's important to note that Tsugumi Ohba has said that he wanted it to be left up to the readers on if Matsuda is right or not. Tsugumi Ohba, writer of Death Note, said that Near "becomes less likeable" as the story advances, citing Near's plan to take the notebook at a later point in the story. Ohba said that a negative reaction originated from "the difference in their attitudes" and that people may have viewed Near as "a cheat." Ohba added that Near's "cheeky behavior," intended to "reinforce his childishness," had been construed as "annoying." In the final chapter Near brings finger puppets to the Yellow Box Warehouse. Takeshi Obata, artist of Death Note, said that Near first bought the Kira finger puppet and drew on it with a magic marker. Obata then said that Near must have created the other puppets afterwards. Obata views Near as not liking L much so Obata had Near depict L as "ugly", and that Near "worked hard" on Mello's puppet as Near "liked Mello." Obata said he enjoyed drawing Near and that Near is also one of his favorite and his least favorite characters, considering him to be the smartest character in the manga "because he cheats." When asked about which character was most similar to himself, Ohba indicated Near and "maybe Light." Regarding Near, Ohba said that he does not leave his house often.